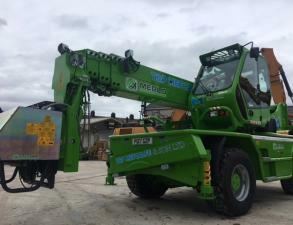 The Merlo 60.24 ROTO MCSS has been a popular seller over the past 12 months, and T&P Metcalfe & Son Ltd continue the trend by adding yet another Merlo to their telehandler fleet. 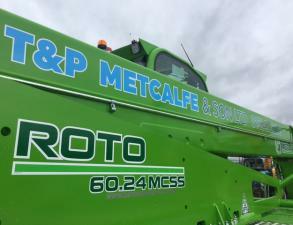 Metcalfe’s have been dealing with Dennis Barnfield Ltd for over 15 years buying a range of plant equipment from Telehandlers and Excavators to RTV’s and Compaction Plates! 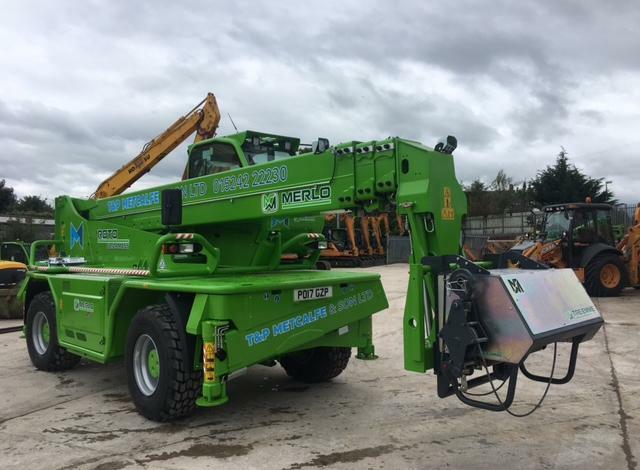 The Merlo brand has always been synonymous with advanced technology in the telehandler field and our history, since 1964, is hallmarked by experience based on determination and passion. The development of complex products, from the idea to the result, from design to sales, means being able to propose orientations of the most competitive markets. Merlo first launched the Roto range with rotating turret in 1991. 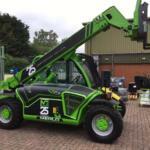 Today sees the newest generation of Roto Telehandlers equipped with Tier 4 Engines. As standard the entire Roto family comes with the patented Merlo system known as EPD (Eco Power Drive), which automatically manages the hydrostatic transmission and the diesel engine, with the EPD control unit placed between the injection pump and the accelerator pedal. The operator sets the speed and the control unit manages the engine rpm to reach the pre-set speed, optimising the engine rpm. This makes it possible to save energy which results in a reduction in consumption. The driver refers to a potentiometer for manually setting the engine revs in relation to operating requirements. 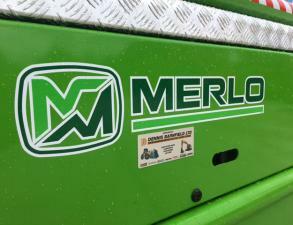 The Merlo cab is known for ease of access to the drivers’s side and for its on board roominess. 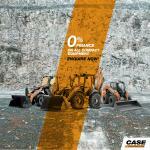 Measuring 101mm, it is the largest in the category and allows maximum comfort, even for more robust operators. The machine’s architecture, the low centre of gravity and the tapered hood ensure excellent visibility in every direction. 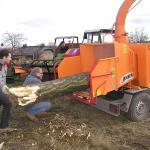 The operator can visually follow the load to its maximum height thanks to the transparent top. The cab is equipped with a powerful A/C and heating system, making it possible to maintain the ideal temperature of 22°, even when operating in extreme external temperatures. The door is fitted with an opening window for better natural ventilation. The controls are practical and reasonably arranged. A new analogue-digital instrument panel has been adopted to provide precise and punctual information. The Merlo 60.24 MCSS Roto benefits from planetary gear units and has two dry brakes. These are designed to ensure maximum efficiency, reducing consumption. Merlo also offers parking brakes as standard, which automatically engage when the diesel engine is turned off. 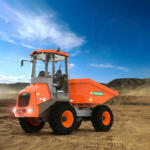 To handle driving on rough terrain, Merlo has designed the EAS System (Electronic Active Suspension), consisting of 4 hydraulic cylinders, a quadrilateral with longitudinal arms and an electronically manage hydropneumatic circuit. The system’s versatility allows the operator to manually set both lateral and longitudinal tilting as shown in the dedicated box. 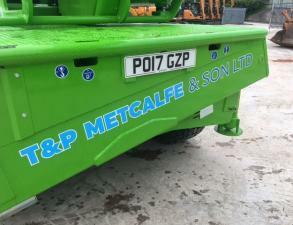 T&P Metcalfe is a family run business based in the North West, situated on the Lancashire, Cumbria and Yorkshire borders. Established in 1981 in the Agricultural and Industrial building industry, supplying and erecting steel framed buildings and all the associated works, from start to completion. Therefore offering customers a complete package. Due to the nature of our work in the mid 90’s, groundworks and civil engineering were added to our growing list of professional skills and services. With management holding over 40 valuable years of knowledge and experience in construction and agriculture, along with a strong, reliable workforce, again many coming from agricultural backgrounds, here at T&P Metcalfe we offer only the best services to each and every one of our clients, both on and off site.